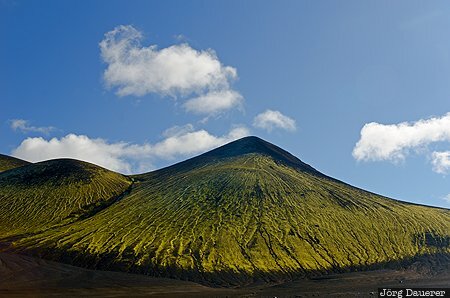 Green moss on top of a perfect cone of black lava sand below a deep blue and some white clouds sky near Landmannalaugar. Landmannalaugar is in Suðurland in the highlands of Iceland. This photo was taken in the morning of a sunny day in September of 2013. This photo was taken with a digital camera.